The epoch of reionization may not be a familiar time period to all, but it gave rise to the luxury we have to be able to see galaxies, stars, and planets far far away! Let’s have a one-minute review on cosmic history. As the Universe expanded after the Big Bang, the hot dense soup of energetic particles cooled down. After about 380,000 years, it cooled down enough where free electrons and protons could find each other and reunite into neutral hydrogen (it did happen, we took pictures!) Hydrogen atoms are extremely good at blocking light. If the Universe stayed neutral, we wouldn’t be able to see so far. So something must have managed to ionize these neutral hydrogen atoms back again for the second time since the first ionization during the Big Bang. Indeed we call the time before such reionization the cosmic dark ages. We aren’t entirely sure what provided the photons responsible for reionizing the Universe. To this end, we astrophysicists are hard-working and creative. Black holes and massive stars, the merging of binary stars, and the low-mass and faint galaxies at high redshifts were found to be the potential suppliers of the ionizing photons. In particular, recent studies have argued in favor of the dominant role of low-mass star-forming galaxies, but there are much more to it. Photons have to escape the galaxies in order to contribute to reionization, on their ways they might be absorbed by gas or dust. What fraction of the ionizing photons could actually leave the galaxies? This is quantified by an important number known as the escape fraction, commonly denoted as fesc. Observationally measuring fesc is challenging. The available sample of ionizing photon-leaking galaxies is limited, and the measurement is sensitive to the local dust content we know nearly nothing about. On the theoretical side, fesc is very model-dependent. For example, different numerical schemes for treating star formation may produce completely different trends in fesc. We therefore result in an almost-unconstrained range of fesc between ~0.01 and 0.6. Today’s paper aims not just to calculate fesc, but to take a step forward in understanding the escape of ionizing photons from galaxies and what regulates fesc. 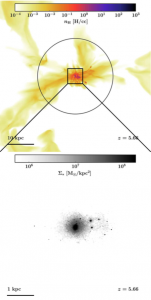 Starting from three low-mass galaxies (with dark matter masses ranging from a tenth to a few billion solar masses) assembled in a cosmological simulation, the authors performed zoomed-in, high-resolution simulations of star formation. Supernova explosions were set to go off 10 Myr after the stars formed. In the course of the simulation, the propagation of ionizing photons was followed and the amount escaping was measured. In this bite we will focus on the representative results of the most massive galaxy out of the three simulated. To have a mental picture of what is going on, let’s take a look at what the galaxies look like. Figure 1 shows the distribution of gas and stellar densities at the end of the simulation. The gas has small structures brought by the strong disturbance of supernovae, and the stars are quite irregularly distributed across the galaxy. These features highlight the importance of starting the simulations from realistic galaxy environments. If we naively measure fesc from idealized configurations, we will be missing the properties that may be crucial in determining how the ionizing photons escape. 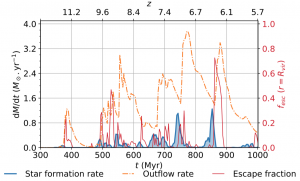 Figure 2 shows the time evolution of the star formation rate (how much gas mass in converted into stars at a given time, in blue), outflow rate (how much mass is propelled out of the galaxy by supernova explosions, in orange), and the escape fraction (red). There are two takeaways from this important plot. First, both star formation and photon escape are very bursty, and the escape fraction varies widely from ~10-5 to ~0.5 in time periods of ~10 Myr! Second, the escape fraction peaks in unison with the outflow rate, typically at ~10 Myr after each star formation episode (blue peaks). Since 10 Myr is the time span set between star formation and supernova explosions, it suggests that the escape of ionizing photons is mostly controlled by supernova explosions. The energetic explosions clear gas out of the surrounding clouds as outflows, creating gas-free escape paths for photons. To test the robustness of this insightful statement, the authors repeat the simulations with different recipes of modeling supernovae. The blue curves of Figure 3 show the same escape fraction evolution in Figure 2, only in logarithmic scale. With a shorter delay of 3 Myr for supernova explosions after stars form, the same episodic photon escape is observed, with similar durations (similar widths of blue and red bands). In contrast, ionizing radiation hardly escapes in the case without supernovae included (black curves). This finding strongly supports the dominant role of supernovae in shaping how photons actually escape low-mass galaxies, which might be the main contributor to cosmic reionization. The rapid variability of the escape fraction implies further challenges to future observations – a bright, star-forming galaxy seen in the UV wavelength may not necessarily be leaking ionizing photons all the time (while most observational surveys of ionizing photons assume so). Nevertheless, today’s paper provides important insights that bring together our theoretical understanding about how ionizing photons travel in galaxies and observations of the escape fraction, a crucial step in uncovering the mystery of reionization!